The Infiniti Q50 is a four-door mid-size luxury sedan that is giving the German luxury brands a run for their money. It’s not only striking to look at, but the interior is flawless while the driving performance is nothing short of spectacular. The Infiniti designers and engineers created a top-of-the-line sedan that turn heads on the highway as it’s blowing the doors off the competition. The Infiniti nameplate has graced Nissan’s luxury brand vehicles since the late 1980s, but it never seemed to catch on with the American public the way Lexus did. The G35 sedan became popular as an entry luxury car, but the rest of the line up was just a rebranded version of Nissan’s vehicles. However, this latest design generation in the Infiniti showroom is really a step up from the old, and they are all worth a second look, from the smallest coupe to the largest SUV. The 2018 Q50 has a distinctive front fascia with Infiniti’s signature double-arch grille. The car’s designers have crafted different looks for each model grade giving owners a chance to choose a particular exterior as well as a model. That design philosophy carries over into the interior starting with a new steering wheel that features molded positions for the driver’s thumbs to afford intuitive fingertip access to reshaped steering shifter paddles. There are four power plants from which to choose. The standard engine, available with a base MSRP of $35,200, is a 208 hp, 2.0 liter turbocharged four cylinder engine that delivers EPA estimated fuel economy numbers of 23 mpg in the city and 30 mpg on the highway. The engine that provides a far more fun driving experience is the 300 hp, 3.0 liter turbocharged V6 engine that gets 20 mpg city and 29 mpg highway. There’s a gas/electric hybrid model that defies the usual concept of the hybrid vehicle as a gas saver. The 360 hp Q50 Hybrid is all about power. But, if you’re all about power, there’s only one Q50 that really matters and that’s the Red Sport 400 with a specially tuned 3.0 liter twin-turbocharged engine that puts out, you guessed it, 400 hp. This is a rip-roaring performance car that matches the Lexus RC F Sport in performance (both go from 0-60 in about 4.4 seconds) but it’s about $15,000 less in price. 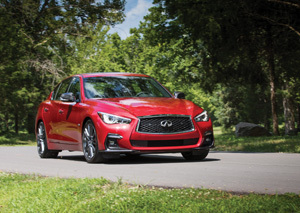 The Infiniti Q50 is an entry luxury sedan that has a model to appeal to a range of buyers. But you’ll have to take a test drive to discover the best one for you.